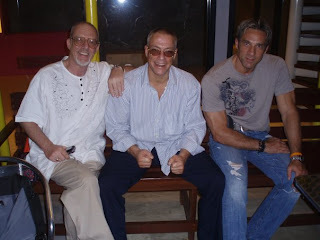 Mike: Just got back from spending a month with Jean-Claude van damme in Bangkok revising his script for "The Tower" which we should be shooting in Ukraine and the States next March, April and May. Andrew: It's his story, then? Producing as well? It's probably his last Martial Arts Movie...he's 50 years old next year and it is a little autobiographical...more like JCVD meets Bloodsport! Before my time the story. Baxime...but Mr. Lim told me the story. Apparently no producers were interested in Van Damme at that time! His accent was too impenetrable, supposedly. I'll see if I can get you and interview with JC...but he's s busy these days. What brought you to the Philippines initially? That's a movie in itself! 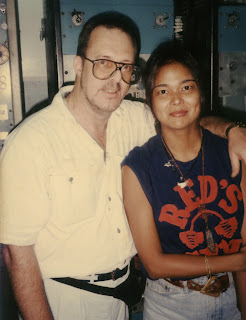 In a nutshell...I married a Filipina I met in the Middle East in the early 80s and we then moved to England. But after a few years she was diagnosed with leukaemia. When she was dying, I brought her back to be with her family. She died a week later (aged 35). I returned to the UK briefly and then decided to return to the Philippines for a year to help her family start a business. I've always been a writer (I sold my first short story in the UK when I was 14 years old) but always with a seemingly impossible desire to write for the movies. As a struggling writer I continued to sell short stories to paperbacks, and also had some stage plays produced in the provinces...but never in London. I also edited several magazines around the world, video magazines and even one about Wine and Cigars...neither of which I had any knowledge of! I had the same Agent in London as Ridley Scott, and he told me to move to Hollywood and circulate for six months...something which I didn't have the funds to do. 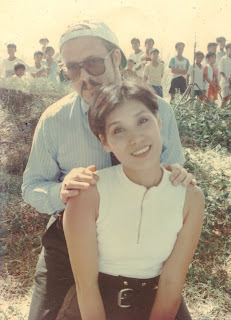 Anyway, I'd basically given up writing for 2 years to nurse my sick Filipina Wife. How did you land your first film gig? A Filipino friend discovered by accident that I was a writer and introduced me to two local Movie Prodcers, Jesse Chua and Boy Agbayani. They asked me to write an Engliah script for them which they bought but never produced. That was around 20 years ago. That got me into the Filipino Movie circle and I was soon acting in local movies (I'd been a stage actor in the UK...small time). I was also hawking movie stories around to local producers and sold a few...but most were never produced. 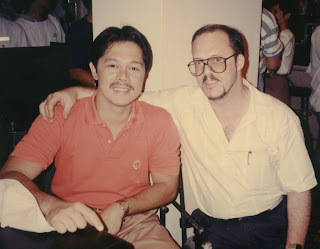 A close friend, Spanish Movie Actor Rom Kristoff, who was also based here for a while, then introduced me to Bobby Suarez. He and Bobby had been very close for many years but had never actually worked together. I remember seeing Rom's name on Bobby's unproduced posters. Rom did a lot of Italian and Local Movies here as the lead. Who introduced you to Mr Lim? 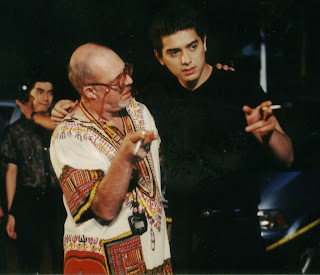 That was the Director Teddy Chua, whom I'd met through Boy Agbayani. Forgot to mention that a few days after meeting Jesse Chua and Boy Agbayani they invited me to the first day's shooting on their new Movie starring Rom Kristoff and entitled "Angel In The Dark", directed by Teddy Chua (maybe under a different name?) and that's where I met the other kwailos working in the movies here...James Gaines, etc. 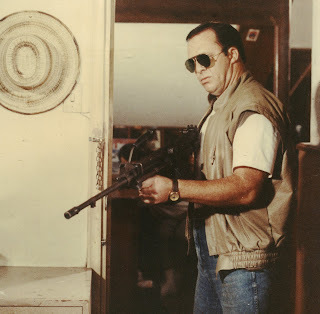 I ended up acting in that movie as a Goon called "Casey"! Actually I also played an extra (different disguises) in 5 other scenes! Teddy Chua (who died last year in October) introduced me to Kimmy Lim as a writer about a year later. I did two scripts for Mr. Lim which were produced. One was an action thriller called "Tukso ng Panahon" whose English title was "Dangerous Passion" and the other was "Anino" (The Shadow) which was a lame rip-off of "The Mask of Zorro" (something I hate doing). But the copycat industry dictated it must be done! 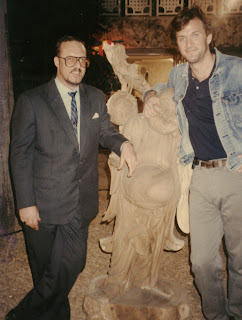 It was also Teddy who introduced me to several Hong Kong Directors, including Philip Ko and Ringo Lam. I always strive to be original...but of course we occasionally "pay homage" to other movies...ha ha! I'm particularly interested in the early 90s, as it seems there's a spike in Hong Kong productions being made in the 'Pines. Philip Ko, of course, is instrumental in making his wife an action star in several of these productions. Then there's Cynthia Khan! 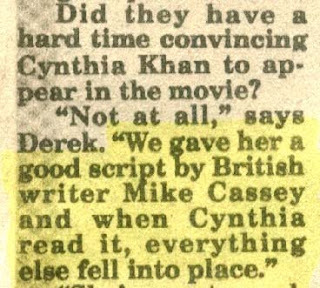 Cynthia Khan was a lovely woman both as a human being and an actress. A very "gentlemanly" woman...if you know what I mean! And I think Teddy Chua was a prime mover in getting some of these productions over here. He would then act as the movie's production manager. 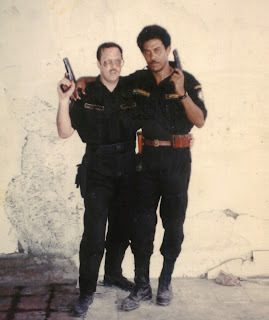 He had a lot of experience and connections both here and in Hong Kong and India. It almost feels like the HK guys took up the slack once the Americans and Europeans started to leave… Now, Philip Ko's English is rather limited - how did he organize his productions? Were they mainly local crews, with an AD who could speak both Cantonese and Tagalog? Very professional. I worked with her on "Matira ang Matibay" (check the date and English title on imdb!). Apparently it was my original script that brought her into the project. Unfortunately, Philip Ko (one of the 3 directors on that project!) was never one for sticking to a script, so the resulting movie was a bit chop-sockey! Because Philip was doing one version for the Philippine market and another version for the Chinese market. We in fact were shooting two versions of the movie at the same time. Philip's English at that time was very poor. 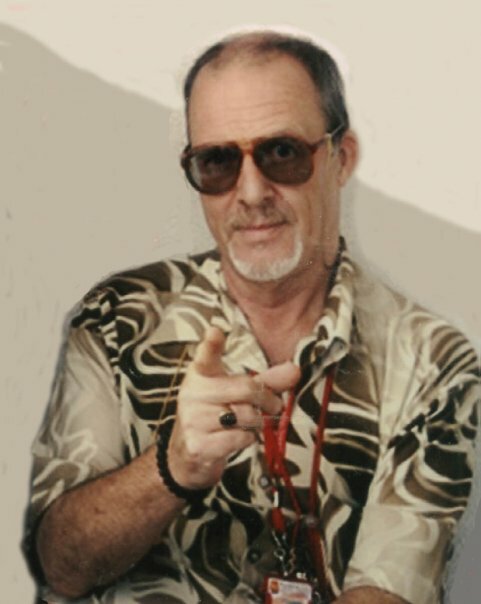 He used a lot of sign language, references to American Movies and an interpreter named Louis Kantana, who was also an Actor here via Malaysia and Hong Kong. Louis now runs his own Hair Salon here. Philip was notorious for firing Actresses from the set...meaning more rewrites for me! He told me that he didn't really like women in his films unless they were "macho" types! When you look at the timeline of Silver Star's productions, you come in at the tail end, when he's down to one or two a year, down from 5-6. Yes. Kimmy Lim is now in his 80s I believe. 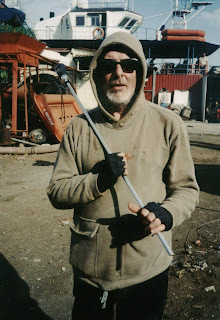 He was getting old when I met him and he was slowing down...but still earning money from the movies he made thirty years ago. Like Bobby, I guess who still manages to resell his old movies even today. In the 1970s and 1980s the Philippines was the Number 3 Film-producing country after Bollywood and Russia. But things really changed because distributors and audiences were becoming more discerning and film technology was improving in an attempt to compete with television and especially video. 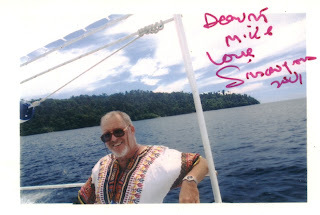 Like you said, I arrived in the Philippines in 1990...at a time the movie industry here was just about to go belly-up! Within a few months of me arriving here, I was working as an actor and extra on a different movie every week. The Italians were shooting 3 or 4 Movies here a year, the Japanese were shooting 3 or 4 Movies (mostly brought here by Hiroshi Akanoma who had a production company here called Rodeo Films), the Koreans were shooting 2 Movies a year, Roger Corman was shooting 2 or3 Movies through Cirio Santiago, Kimmy Lim was shooting at least 2 Movies per year, Bobby Suarez was shooting 2 Movies, Pacific Hollywood (based here with American Producer Mike Sellers (check spelling!) was shooting at least one international movie per year and then of course there were plenty of local movies. I forgot to mention Solar Films who were doing co-productions with Hong Kong via Philip Ko. I managed to earn a decent living by acting and selling scripts and storylines to most of these companies and even English scripts to Regal Films. 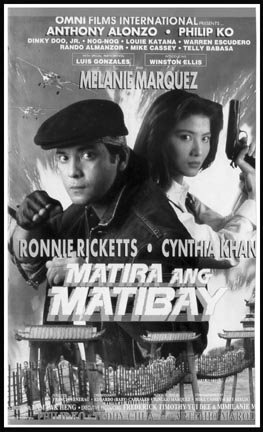 Unfortunately, most of my scripts were never produced because during 1991-92 the decline in the Philippine Movie business had already started with a vengeance. Mother Lily was scared of making international movies because she, like most of the local Producers (with the sole exception of Bobby Suarez) did not understand what was required for international movies, especially technically speaking. There were almost no Filipino writers, cinematographers, cameramen, editors or composers who really understood the needs of international Distributors and audiences.So Mother Lily wanted to stay in her comfort zone of producing local movies only for the local market. It's what she understood and was good at. To her, it was almost the same as selling sacks of rice. Ought to mention that Mother Lily's husband and her son Dondon Montenegro did see the potential in Regal producing international movies and they were the ones who sanctioned three English scripts from me. But by then the decline had set in and it was too late. From what Jim Gaines told me, Mother Lily had no interest in the action films - more comedies and teen romances. Mother Lily was only interested in one aspect of a movie...the budget! Whenever I would present her with a 10-page proposal for a project, she would skip past the story pages, the actors, locations, etc. and go straight to the bottom line of the budget and say, "Too expensive!" End of meeting! For her, action was too expensive to shoot, which is why she stuck to comedies, dramas and romances. And to her credit, she knew exactly what local audiences wanted in terms of those limited genres. For her, action was too expensive to shoot, which is why she stuck to comedies, dramas and romances. But other companies made a good go at the export trade. Cine Suerte, for instance, not to mention Cinex. Yes, you're right. 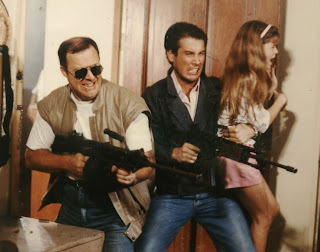 There were a handful of local companies concentrating on action movies, starring local action stars like Fernando Poe Jr., Bong Revilla, Ronnie Ricketts, etc. So why the DRAMATIC drop around '89, '90? Surely it has something to do with the international market saturated with jungle action films and Platoon knockoffs? Yours is a good point, Andrew, that maybe the market was tired of the Vietnam war movies being made here and re-hashes of lost treasure stories, but personally I don't think that is the real reason. Most local movie people attribute the collapse of the movie industry here to the upsurge in video/DVD piracy. I totally disagree with that simplistic opinion. In my humble opinion, there were two reasons for the collapse of the Philippine cinema. One was technical and the other was corruption. Okay, on the technical front, International Movie Distributors and audiences were becoming more demanding and sophisticated. Remember that in the early 1980s we already had stereo TV and as early as 1984, Philips in Europe had developed the laser-disc. So Pinoy-made action films were starting to look relatively threadbare and impoverished? Audiences expected their movies to have live-sound (not dubbed), be in stereo (UltraStereo was the fad for B-movies back then), to be in widescreen, to have great soundtracks and (thanks to MTV) be fast-paced and tightly-edited. Local Producers and Directors just didn't keep up with the changing cinematic trends but instead kept churning out the same old low-tech fodder. The local post-houses also did not update their equipment. The international Distributors were just buying these products any more. Going back to the technical aspect of local movies...When I, my American Producer and Bobby were recently talking about the remake of Cleopatra Wong...Bobby was quite surprised when we told him that he would have to shoot it differently to the way he used to shoot in the past. We gave him a list of demands that he had to meet such as shooting on super 35mm, always using two cameras, having live sound with a stereo soundtrack, with post-prod. done in Thailand and using real American actors...he was quite shocked. The other main reason for the collapse of the Philippine movie industry was local corruption. By the late 1980s, the Philippines had earned bad press in America and Hong Kong for ripping of foreign movie productions. Unfortunately, this is a label that still sticks. Unfortunately it's part of the Philippine psyche to think short-term and not long-term. But these stories soon spread around the international movie community and the Philippines were unofficially blacklisted. 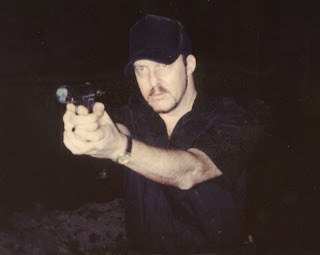 I think that because I was involved more with writing (and eventually directing...I've directed stage plays in the UK) I was always in the underbelly of the movie industry here...meeting with local Producers and Directors as well as Directors and producers from Hong Kong, Malaysia and China. Acting was never my real aim, so I guess I was always more low-key than some of the other players even though I knew them all). But that's my style. I don't think most of the other players knew who I was or what I was really up to. I'm not normally a gossiper! [10 years ago] was around the time that Hiroshi Akanoma hanged himself in his apartment because of mounting debt and no movie deals. I live in the same building that Hiroshi lived in and was the first one to get to his body after his girlfriend found him. But he was already dead when I got there. hanged himself with his own underpants! Very sad...a really nice human being. I miss him a lot but his girlfriend is back here now after living in Japan for a while. This is Hiroshi of Rodeo Films? That's a very sad story. I'm not aware of the films he was producing for the Japanese market in the Philippines - can you please fill me in? I'm not sure of all the movies he produced here, but they were usually co-productions between Rodeo and various Japanese movie companies, usually with Japanese actors in the leads and the usual local kwailo crowd in support roles. Should be easy to check on imdb. The only title i can remember is one called "Double Barrel" with Mike Monty. Rom Kristoff (who introduced me to Akanoma) often played a key role in these movies. Can we moves back into your films as scriptwriter? I'm fascinated in the series of video features you scripted in the late 90s directed by Teddy Chiu and Philip Ko for what looks like a Malay company? The Resort Murders, for instance. That was all through Philip Ko, who was wheeling and dealing to get movies projects from all over Asia. 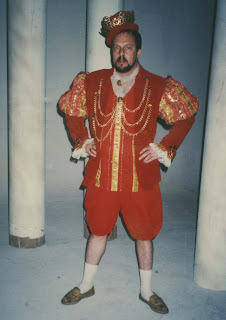 Because of Philip's "unique" style of directing (he would often change actors and locations in the middle of the shoot!) I scripted most of those "on the fly" rewriting the stories, scenes and characters on a yellow pad on the set during the shooting. No time to type them up! These are between '96 and '98 - where are the markets he's selling to at the time? We often had a mixture of Chinese actors, Korean actors, Malaysian actors, Western actors...all speaking their own languages! Pure bedlam! But a great way to improve my writing skills. No writer's block on those movies! Philip was trying to cover and sell to all the Asian markets. Some were shown theatrically in some countries, some only on TV and some direct-to-video. Was there a Malaysian theatrical or direct-to-video market Philip was targeting? I think most of them made money...for someone! Not to the West, at this stage? Philip's style meant that he could never really break into the mainstream and so his market was always "B". that also meant low-budgets, short shooting schedules...and lots of confusion. I was never in on the marketing schemes to most of these productions, so don't know much about their back-end deals. I'm sure some of them wound up on in Western video stores. Most of the post-production was done in the countries that financed them, China, Hong Kong, Malaysia...we just provided the raw footage. So I never saw the final cut of these movies...or even knew their release titles! Do you remember the name of the company? I've found "HVD Entertainment" listed. Yes...I think that was a Malaysian company. We never met the producers at all, just the actors. Philip released several of them under his "One Take" company in Hong Kong. Sorry I can't be much more help. We shot around 9 movies back-to-back and I was writing, acting and Assistant Directing (with Teddy) on all them so it's all pretty much of a blur! And I usually had to baby-sit the actors that didn't speak Cantonese...you know, take them to restaurants, sight-seeing, etc. Whew! Then there was Xtreme Warriors/Digital Man (2001), another Ko film with Yukari Ôshima aka Cynthia Luster. What do you remember about Yukari? That was produced by a Hong Kong company and Solar Films here in the Philippines. 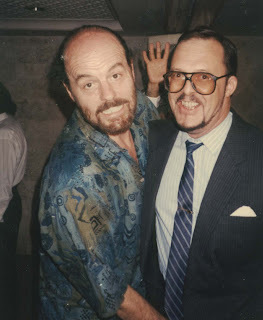 I was always on-set for all of Philip's films, rewriting, acting and directing some scenes with Teddy. Cynthia Luster became a close friend for a while and she's another really professional actress with a great personality. She was actually recovering from a knee injury while shooting that movie, so it was pretty difficult for her...but she never complained. A real trouper I've actually got some behind-the-scenes video footage of that production. Haven't watched it in years since my video camera packed up. Be good if I could get it transferred to DVD and send it to you. Wow! I'd love to see it! Give some time to find it among my boxes of stuff! So Solar were quite active securing overseas deals? Yes, Solar had some movie connections in Hong Kong. The two brothers that run Solar (forget their names off the top of my head...will check later) were part Chinese. Again, I sold them two action scripts that Philip was slated to direct with Hong Kong actors and local actors. But they never reached production stage. God...if only all the scripts that I sold were produced, then my imdb credits would be longer that Steven Spielberg's! Solar was the Tien Brothers? Wilson and...? Right! I always dealt with Wilson. All our meetings were in a Chinese Restaurant! Filipino producers always have eating-meetings! They love their abodo…Can we please talk about your association with Bobby A. Suarez? I believe it was early in 1992 that I first met Bobby. 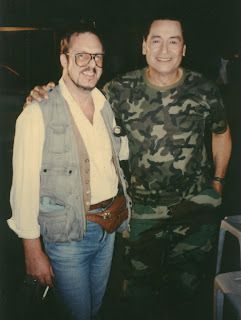 We were introduced by a mutual friend, Spanish actor Rom Kristoff who took me to the Basfilm office in Santa Cruz, next to Manila's Chinatown. This was the office of Bobby's film production company. 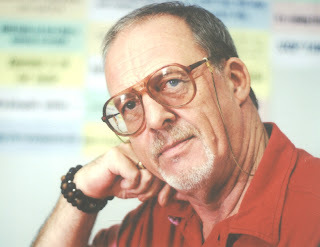 It was a very small office whose walls were adorned with posters of Bobby's movies and international movies that his company was acquiring for sale in Asia. It was a family-run company. His Wife Gene who was the company Secretary-Accountant was there along with his two sons Ritchie and John. It was a very warm and friendly atmosphere, so I immediate felt relaxed and at home. Bobby also seemed to like me right off the bat, too. 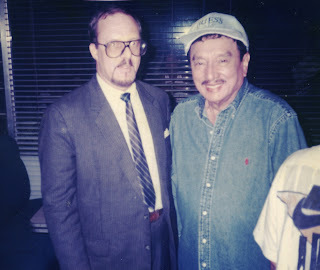 He told me later that I reminded him of the late Mr. Digby (don’t know his first name), the Boss of Rank Distributors here in the Philippines many years ago and the man who took the orphaned teenaged Bobby under his wing, gave him his first real job and thus introduced him to the international movie business. He became a father-figure to Bobby and made a great impression on his life and his future. Bobby calls us both “British Gentlemen”, which I appreciate. Although these days, Bobby and I call each “brother”, which is a term that signifies our closeness and our mutual respect. We also help one another out and our respective families whenever there is a problem, because his family and mine are more than just close friends. 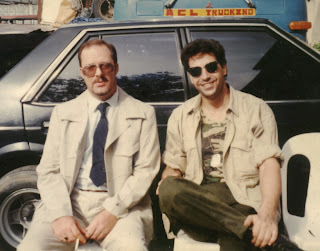 Back to the first time we met in 1992...before long I was a regular visitor to Bobby’s modest office, working on movie storylines and scripts for him, as well as helping him write important international letters and other specialized documents for his company. I never asked for a salary, but Bobby always fed me and gave me travel money and little extras here and there for my daughter’s birthday, etc. This close, unique professional and personal relationship has continued right up until the present day...almost 18 years now. 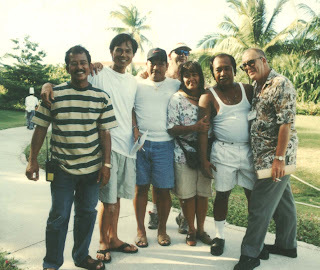 But many of the Directors, Producers, Stuntmen, Production Crew and Actors that used to frequent Bobby’s doorstep have moved on like James Gaines, Maria Isabel Lopez, Rom Kristoff, Franco Guerrero, Nigel Hogge, or even passed on like Jim Moss, Teddy Chiu, Mike Monti, Steve Nicholson, Ken Metcalfe and Hiroshi Akanoma. Although Bobby and I have never actually yet worked on a project together, today, Bobby and I are still regularly in touch and I’m still helping him with Storylines and scripts on a regular basis. As I think you know, Andrew, even though Bobby is now getting on in years (aren’t we all?) he would still dearly love to make a comeback to his first love of making movies. 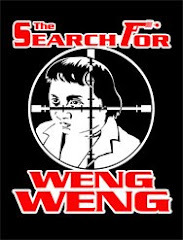 In our own modest way, I and an American Movie buddy Larry Cain (who has worked as a Cameraman, Steadicam operator and Technical Consultant on many Filipino movies and TV commercials) are trying to raise the funds so that Bobby can do a modern remake of either “Cleopatra Wong” or “one-Armed Executioner”. British action star Gary Daniels (who is a close friend of mine and Bobby’s) has shown an interest in starring in these projects out of his respect and gratitude to Bobby who helped Gary kick-start his Hollywood movie career by giving him producer contacts in Hollywood when Gary was in the Philippines (like Van Damme and others) hoping to get a role in the multitude of low-budget actioners being shot here in the 1970s and 1980s). Gary didn’t have much success here in the Philippines but he did make it big (at least for a while) when he got the lead role in Hollywood-Japanese movie “Fists of the North Star” in 1995. 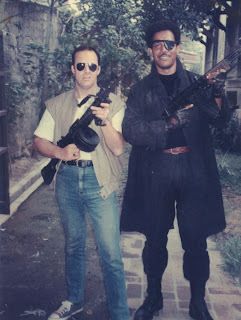 And his career seems to on the rise again after he appeared opposite Steven Segal in “Submerged”, has just finished shooting “The Expendables” with Sly Stallone, Jet Li and Jason Statham and now plays the villain in Wesley Snipes’ new movie. Gary’s a really nice, grounded and hard-working guy who deserves to be successful I’m sure I can get you an interview with him, if you wish. He’s a very friendly and amenable guy. I met up with him a month ago in Bangkok and he is in absolutely amazing physical shape...the best I’ve ever seen him. 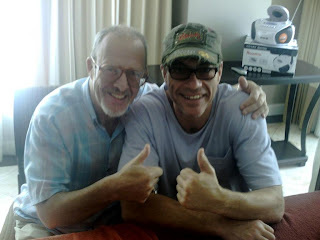 In Bangkok I introduced Gary to Van Damme and they got on very well together. Van Damme was talking of offering Gary a role in his upcoming “The Tower” movie, but I’ve no idea if that will pan out or not. Another good move for Gary, if it pushes through. Let's go back to when Bobby first approached you with the idea of doing Vengeance... It's a title he'd had on the shelf since '77! How had it mutated by the time you came on board? Actually, a few years ago (maybe four or five? ), Bobby was approached by Bigfoot Entertainment, a movie production company and Movie School based in Cebu in the Philippines and founded by a German. He knew the old Cleopatra Wong Movie and wanted to use it as a starring vehicle for his Vietnamese girlfriend, model Bebe Pham and so approached Bobby about a remake co-production. And then Bobby called you in? At what point did this happen? Yes, Bobby asked me to work on a new "Cleopatra" script. Bobby and I work very well together as a writing team. Bobby has great cinematic ideas, so we met at my apartment in Ermita and Bobby explained his ideas and jotted them down on paper. I'm one of the few people who can understand his writing "shorthand" and I instantly understand where he's going with an idea. Then he left me alone for a few weeks to work on the first draft, sending me occasional e-mails with more ideas. If Bobby has one flaw about his story-telling, it's that he forgets that today we have the Internet, cell-phones, GPS, etc., so I have to work those factors into the script. But yes, Bobby was "on fire" because like me, he is so passionate about his craft. Bobby's ideas are usual "general" and not too specific, so I have to work on the characters and what makes them tick, as well as figuring out story elements such as a "ticking bomb" scenario, double-crosses, moments of pathos, etc. Stuff to provide the tension and audience interest in between the five or so set action sequences. And like Bobby, I hate loose ends and plot loopholes. We don't want an audience asking questions like, "Why did he do that instead of...?" when they should be just carried along by the movie! I did five rewrites of that script until we were both happy with it. But Bobby does worry about some details...such as his leads' costumes and weapons. But like you say, Bobby just wants to "cut to the chase", and he has great ideas about new action angles, too! Gary Daniels was lined up to play the male lead, with Doris Young (the original Cleopatra Wong) playing the "Mother" and with Bebe Pham as her daughter...the new Cleopatra Wong. The torch passed from the Mother to a new generation. 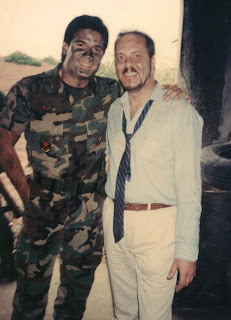 The German executive producer, Michael Gleissner also had a role under his screen name of Ken Arden. Your readers can check out BigFoot's website at www.bigfoot.com. But as you know, that movie eventually fell by the wayside. That was due to problems over the budget. Bobby really wanted to shoot the movie in and around Manila and use a local grip house for the equipment hire, all with a view to minimizing the production costs. 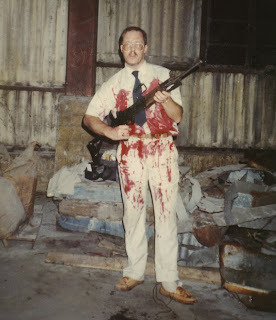 But Gleissner wanted Bobby to shoot everything at Bigfoot in Cebu, using their equipment and facilities. But that ballooned the budget because of extra air fares and hotel accommodation for our production crew and local actors. Although the new script belonged to Bigfoot, Bobby wisely didn't sell them the rights to the Cleopatra Wong character which belonged to him. And so the project was cancelled. Michael Gleissner had a good reason for wanting the movie to be made at the Bigfoot studios, which I understand perfectly. He has a Film School there and wanted his students to have first-hand experience of film-making and we would also have used some of his students, as actors, extras and interns. But it wasn't to be. You can imagine Bobby's deep disappointment at not being able to push through with his long-awaited movie comeback. How do you think Bobby would adapt to the new film world - new audiences, new technology, new markets? Excellent question. To be honest, I don't think he realizes just how much movie-making has changed in the past 10-20 years. As I think I said before, even low-budget movies must now have live sound, better lighting, Dolby Soundtracks, fast-paced editing, a good soundtrack, be in widescreen and with great cinematography with 2 cameras. The stories must also embrace new technologies such as mobile phones, GPS, Bluetooth, the Internet, satellites, etc. In the small movies made in 1960s and 1970s, those criteria did not exist. For example, a page of script 20 years ago was always timed at 1-minute of screen time but today one page of script is reckoned at 45-50 seconds screen time.